Your Mixlr livepage is a unique URL which your listeners can visit to hear your Mixlr broadcasts. This article will show what you can do to personalize your page. Your profile picture will be displayed throughout our website and app, both on your own livepage and next to your username if you are visiting other Mixlr livepages. It will also be displayed on your embeddable live player. Find out how to add a profile picture here. As well as your profile image you can add an artwork image for your Mixlr account to customise your livepage. This image is also featured in the embeddable live player which you can add to your website or blog. Find out how to upload your artwork image here. Both the profile picture and the artwork will be displayed on your embeddable player, so if you’re planning on using it make sure you choose pictures that blend in nicely with the rest of the page. Find out how you you can customize your embeddable player here. 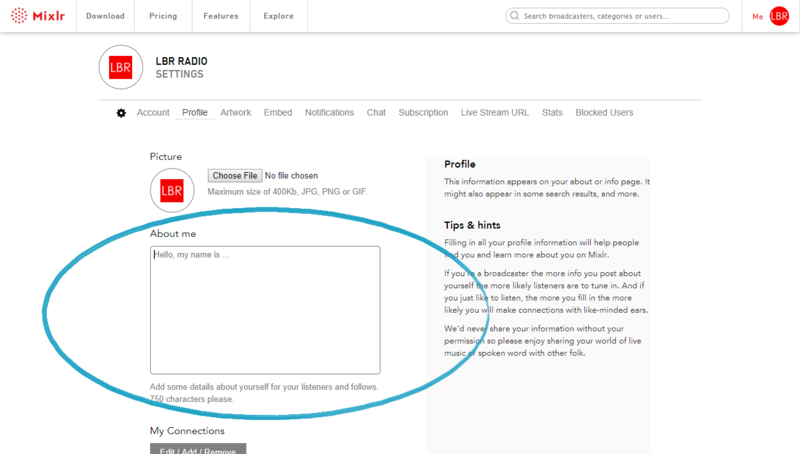 You can add text to your Mixlr livepage to add a little about yourself and to let any listeners who have found your page know what you'll be broadcasting. To add this text, go to your Profile settings page. Once on the Profile settings page you can add text to the box under the heading 'About Me'. You can enter up to 750 characters here. Once you have entered your text, scroll down to the bottom of the page and click 'Save Changes'. Your Mixlr livepage can also contain links to any external webpages which you would like your listeners to visit. 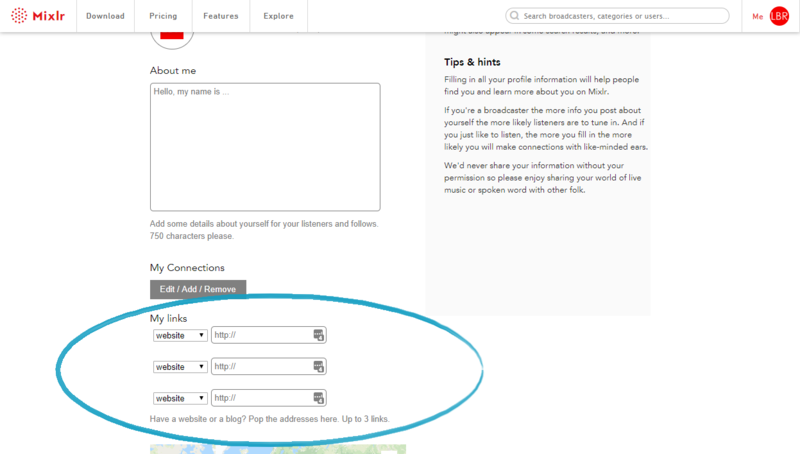 You can enter up to three external website links under the 'My links' section of your Profile settings page. Once you have entered the details of your external websites scroll down the page and click 'Save Changes'. Click here to find out more about your Mixlr livepage.